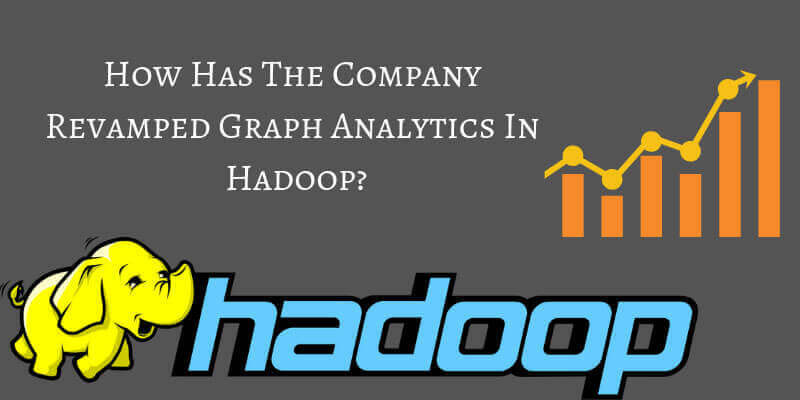 How Has The Company Revamped Graph Analytics In Hadoop? Most of the people perceive something as elaborative as Big Data to be just heaps of unstructured data. Big Data is indeed a collection of huge chunks of data, and most part of it is unstructured. But, you would be amazed to know, that regardless of the fact that the volume of data is so high, still you can see some sort of connection or you can see even a structure amongst the various data sets. As per the structure or the connection within the data, Big Data experts tend to figure out the best representation schemes which would be ideal to manage and showcase the data and the insights received from the data. One of the most generic pattern which is ideally observed in the Big Data field is a hierarchy representation. With this form of representation of data, experts are able to easily manage and showcase various intricate business models as well as a series of event or plans. Though, the best way to identify a structure, and to represent the data is definitely through visual representations and the most widely used form is surely the graphical presentation. Therefore, one of the most popular Big Data player, Hadoop has recently revamped the way its graph analytics work. We’ll explore that in this article. How important it is to represent the data? Big Data is a collection of high volume of data sets. Thus, the representation of the data or rather the representation of the insights churned out from the data is important. As, only if the Big Data experts are able to showcase the data and the insights in the most attractive manner, then only collection and analysis of Big Data will be deemed useful. As, it is important for the companies to know what kind of data is collected and how it can help the company. Thus, it is important for the Big Data associates to learn the latest techniques of representing Big Data and the insights in a compelling manner. One of the best ways to represent intricate data sets or the complex insights generated by the analysis of Data is via visual representation. As, with the help of visual representation, Big Data experts would be able to convey their message in an appealing manner. And, this is very important. Big Data experts have to make sure that they are able to make the representation of data or the insights very appealing because then only the experts will be able to communicate what they want to. After all, collection and analysis of Big Data is a lengthy and time consuming process. Thus, only when the company is able to make use of the Big Data insights for the betterment of the firm, then only the whole process will be deemed useful for the company. Therefore, Big Data experts have to make sure that they use various features offered by the best platforms like Hadoop to represent the data in the graphical manner. One of the best ways to represent the data and the insights in the most interesting way is through graphs. As, with the help of various graphical representation functions present in Hadoop, one can easily showcase the data and the insights in a way which is easy to understand by the audience. With the help of graphs, experts would not be able to only convey their message but, they will also be able to make sure that the data which they have collected is actually useful for the company. Graphs, in the world of Big Data are known as ‘networks’. They are nothing but ubiquitous across a plenty of web apps. Graph analysis basically includes a huge set of nodes and edges. Now, here, a node is nothing but an object, whereas, an edge is the connection between two nodes. For example, a node is a person and edge can be the relation like friendship. A connection of train between two places is also a classic example of graph analysis. Graph analytics has been used since many days. They offer more strength and direction of a connection between different objects in the graph. Graph analytics include several pathways to function. With the help of graph analysis, an expert can easily store, manage as well as query data, and in some cases, one can even track data using graph analytics. Also, the assessment of entities which are connected is made possible by graphical analysis. So, all and all, we can say that graph analytics has the potential to make Big Data less clustered. This is one of the reasons why Graph analytics is quickly becoming one of the key features of Hadoop. Hadoop had been a top choice of the Big Data experts since many years. One of the biggest reason is that Hadoop has been constantly upgraded. The platform is made better to meet the ever changing needs of the world. However, there were a few reports in the past where a few of the people said that probably Hadoop is not as strong as people expect it to be when it comes to encryption at both storage well as network levels. This is where the role of Graph analytics comes in to play as it makes it easy to analyst the data systematically. Hadoop has realized that Graph analytics can very well work on a platform. At the same time, it can also store data in an easy to read format Graph analysis enhances intra-cluster similarity thus, it is being used widely by the Big Data experts. And, now, as Hadoop seems to offer a revolutionary feature for graph analysis, we are sure that the market of Hadoop is definitely going to expand more. Already, Hadoop Development services is amongst the top choice of Big Data experts and with this enhanced graph analytics facility, it will be a big hit amongst the Big Data specialists. What's Encumbering The Exceptional Adoption Of Hadoop?